Twitter’s livestreaming app, Periscope, continues to take social media by storm. Both small and large businesses are using the platform to engage in new and unique ways with their audiences. But as with any new tool or app, it can take some time to figure out how best to utilize it. 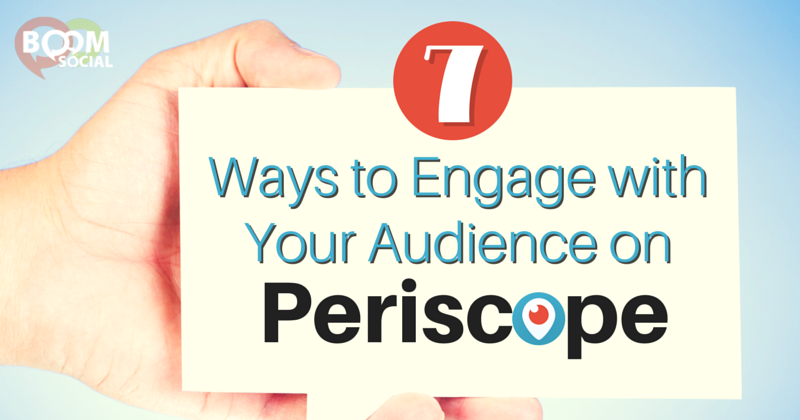 This post will cover 7 ways you can engage with your audience on Periscope. Please leave your best tips and strategies in the comments below! The beauty of livestreaming (as opposed to sharing pre-recorded video) is that you can share your thoughts and ideas in the moment. There’s a certain degree of unpredictability and spontaneity that you just don’t get with recorded video. Leverage this spur of the moment sharing by using the platform to show live behind-the-scenes clips (office tours, candid interviews, random thoughts, etc.). These types of videos are great for showing the personal side of your brand, and for getting your audience emotionally invested in your business. Have a Twitter follower who’s struggling with using your product or needs instructions for how to perform a certain task? Livestream your explanation rather than trying to write it out. Not only can this be a more effective way to explain a process, it can attract the attention of your other Periscope followers. If you regularly speak at conferences or other events, why not share your talks with your online audience as well? Sharing your video later is great, but allowing your followers to watch live takes things to a whole new level. You can even respond to questions asked by your Periscope followers so they really feel like they’re part of the action. This is a great strategy for getting engagement from existing followers, as well as for attracting new followers. Periodically hold live giveaways to generate a buzz around your brand. 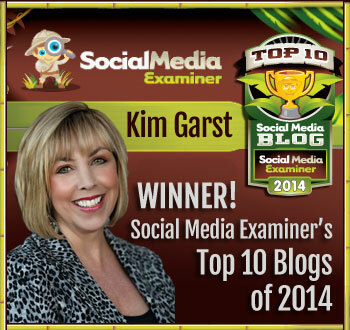 Announce and explain a blog or Facebook contest live on Periscope. Looking for contest ideas? See my post 13 Killer Facebook Contest Ideas. Twitter is king when it comes to reporting breaking news. Big media outlets use Twitter more than any other platform for sharing live and time-sensitive news; why not use Periscope to share or respond to these news items while the iron’s hot. 52% of people follow a brand on Twitter for the special offers and promotions. Periscope can be a great way to announce promotions in a way that engages your audience and attracts new followers. Some ideas for promotions: coupons (or coupons codes), % off discounts, 2 for 1 sales, discounted services, free samples, etc. I hope these strategies have given you some ideas for engaging your audience on Periscope. I regularly livecast some of my BEST marketing tips and tricks for business owners….be sure to follow me on Twitter so you don’t miss out! 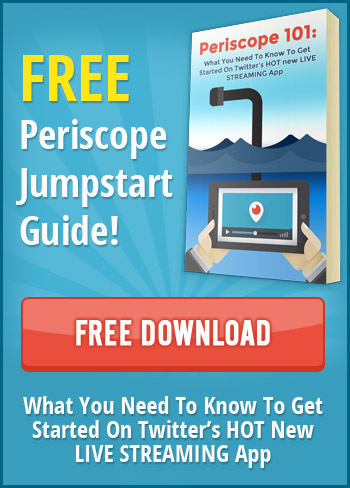 Wondering how Periscope can you help you increase sales and revenue? Check out my post, 5 Quick and Easy Ways to Use Periscope to Drive More Sales or better yet, my brand new course, Periscope Profit Machine where I share exactly how not only get started on Periscope but how to use it to drive more traffic, leads and sales for your business. Are you using Periscope for your business? What are your best tips for engaging your audience on the platform? Share below! Again directly from my inbox to your blog post now! Definitely it is a great strategy to engage audience by providing Giveaways or contests! It’s works amazingly and you said it some of your post more times. I like it very much. For getting good results we should give valuable Giveaways! However, it is worth to implement all these 7 ways if we want to engage our audience. Hi Kim! haven’t started using Periscope yet…but was wondering what your thoughts might be on how to use it related to my new video podcast? Also, how are you liking that Flare sharebar thingy? I’ll look into this. I haven’t heard of periscope before! I am now using Periscope for business! I love this app! Ideas on how to use can be for showing off new product that just came out. Another way to us is by showing people how to use your product. The possibilities are endless. Great article! I just started using Periscope a couple of weeks ago, so I really appreciate the ideas. My most recent broadcast (is that even the right word?) was yesterday at Busch Gardens in Williamsburg while my 5 year old and I were on the swings ride. So much fun! Periscope is going to be famous app. Thanks for sharing this guidance. I haven’t used this tool but after your post I will check it. The information provided here interested me a lot, thanks for sharing! I have been trying to do my own broadcasts (typically every other day) and I have a nice little following so far. I’m definitely going to start taking advantage of it though for deals and promotions. I wonder what you think of the new Facebook Live app, which is like Periscope, but better in some aspects, according to some people like Joel Comm. I have seen some pretty amazing results from using it. I get great reach every time I go live as well as great engagement in the comments. So happy to see they have started rolling it out to more than just those with verified Pages. I am still all in on Periscope too :-). I’ve seen a lot of people doing live training scopes on specific strategies to do XYZ. They’re really useful — and fun to watch too.